Yoga holds the key for self-unfoldment and self-improvement, but without a systematic knowledge and understanding, it can pose a big challenge to help others and ourselves. For those who wish to teach, the training will empower you to self-awareness, self-healing and self-discovery, and provide you with the knowledge and confidence to lead classes. f you are enrolling in 100 Hours course, there is no prerequisite. All are welcome - whether you are completely new to the practice of Yoga or have been doing it for some time and now you would like to understand yoga techniques and meanings. Firstly, Gwen Wenli is authorized to conduct Union Yoga Ayurveda’s Yoga Teachers Training program. Secondly, Union Yoga Ayurveda is a Registered Yoga School (RYS) with Yoga Alliance, USA, as well as affiliated to Indian Institute of Patanjali Yoga of Paramhansa Samsthana, India. Through our curriculum, we create a foundation for teaching yoga skillfully, effectively and relevantly; it is one of the most holistic and therapeutic yoga teacher training available. Yoga Alliance is the world’s largest and widely recognized standards-setting organization for Yoga Teachers. 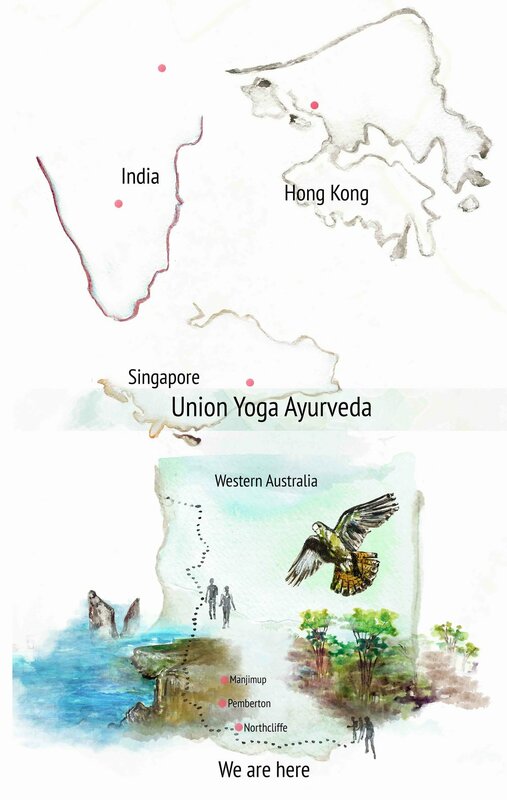 Our Yoga Alliance certified training qualifies you to teach in both Australia and all over the world upon graduation. After the successful completion of the course you may register with Yoga Alliance as Registered Yoga Teachers (RYTs). Start by enrolling in 100 hours and progressively upgrading to 250/350/500 hours. o achieve 500 hours, you keep adding the additional hours of the next course. After the completion of Foundation I you are awarded 100 hours certificate. At the time of registration, you pay 100 hours course fees. If you like to continue with the Foundation II, then you are awarded 250 hours certificate and you pay the difference of 250 hours course fees. If you would like to continue further with Foundation III, you are awarded 350 hours certificate and you pay the difference of 350 hours course fees. Finally if you decide to continue with Advance you are awarded 500 hours certificate and you pay the difference of 500 hours course fees. Example: Once you enroll into Foundation I and have paid $1800 for it. After completion of 100 hrs, you decide that you would like to proceed to Foundation II, then you simply add 150 more hours toward the 250 hours and you just pay the difference of course fees which in this case will be $2650 and so on. Foundation I: This is the first step to your yoga journey if you would like to share or teach yoga. This course is recommended for people who would like to deepen their knowledge and practice of yoga particularly asana and would like to become self-practitioner. This course primarily focuses on the technique, training, practice & all categories of yoga asanas & sequences, and gives you an insight into Yoga health & diet. Foundation II: This second step is your initiation towards being a yoga teacher. It builds upon the technique, training & practice part of the teacher-training program and teaches you to practice pranayama and understanding Yoga Physiology of prana bodies. This course also deepens the knowledge & understanding of human anatomy & physiology in context of yoga asana & pranayama practice, which allows you to practice safely yourself, and while imparting this knowledge & practice to others. You will start to study the most notable Patanjali Yoga Sutra, and the importance of communication and Teaching Methodologies. Foundation III: This builds your knowledge & understanding further in the area of yoga philosophy & yoga skills both. In the yoga application part of the course, you will have the chance to understand how yoga addresses stress cycles, yogic diet and Ayurveda its relevance to the practice, in this course you will learn about Yoga Physiology including detail study of chakra system. You will start the Study the Mindfulness. In the Technique, Training & Practice (TTP) part, you will be introduced to special techniques to lower back pain, Yoga Nidra and Mindfulness. Advance: This course builds your knowledge & understanding further in the area of yoga philosophy & modern yoga styles both. In the Philosophy part of the course, you will get a chance to understand the Science of Ayurveda In the TTP part, we will explore some styles of yoga and special techniques. Why Choose The Southern Forest For Your Yoga Teacher Training? The southwest is not marred by congestion, traffic jams, dirty air or noise pollution, so you can unwind, de-stress and rejuvenate in a quiet and pristine environment. During the Yoga Teacher Training you will get to enjoy the pristine beaches and waters on ancestral lands. Recommended reading Dark Emu by Bruce Pascoe. Inspired by ancient Japanese practices, Shinrin-yoku is to let nature enter your body through all five senses. Walking among these ancient trees without distractions or hurrying ― ideally for two hours or more ― counts as a bath in the forest. The trail extends from Perth to Albany, whichever section you choose to walk and complete, you will feel an inner peace, a sense of confidence to keep moving forward with readiness. Hiking is perhaps one of the best ways to enjoy the beauty of nature and wildlife. Have you ever wondered why hiking is soothing? This is due to various wood and plant essential oils called phytoncide responsible for the positive effects of forest air, inhaling phytoncide actually improve immune system function. Even food taste extra delicious in nature! Fonty's Pool is a historic freshwater swimming pool near Manjimup, Western Australia. It is registered with the National Trust of Australia as an area of heritage significance. Fonty's Pool offer a range of accommodation to suit all budgets; shared accommodation can be as low as $30 depending on the numbers (please contact Gwen for this option), there are non-powered, powered caravan and camp sites. For more information visit Fonty's Pool. Malimup Springs covers approximately 100 acres of land and is located within the D’Entrecasteaux National Park in the south west of Western Australia. The February 2015 Northcliffe bushfire destroyed almost all of the buildings on the site. Malimup Springs is a very important place from an Aboriginal Cultural Perspective and has significant environment value. The hydrology of the region is also very unique. Fresh water bubbles to the surface at many points on the property and in a number of places waterfalls run from the ancient cliffs directly onto the beach and water drips from caves along the beach.